Looking to grab some cash for cans? Well, this character looks pretty happy as he walks with one arm towards cashing out a box of cans. 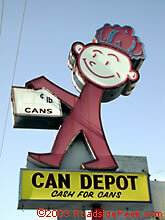 This sign calls out the business Can Depot. This marquee for the Tucson Seat Cover Co. is rather interesting when you stare at the close-up. Not sure why, but it is. 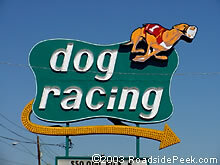 This large marquee for the Dog Racing track in Phoenix is a can't miss sight off the road. Yes, it is this way to the greyhounds. 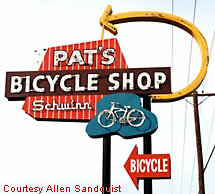 Here's a cool roadside sign for Pat's Bicycle Shop in Tempe, AZ. 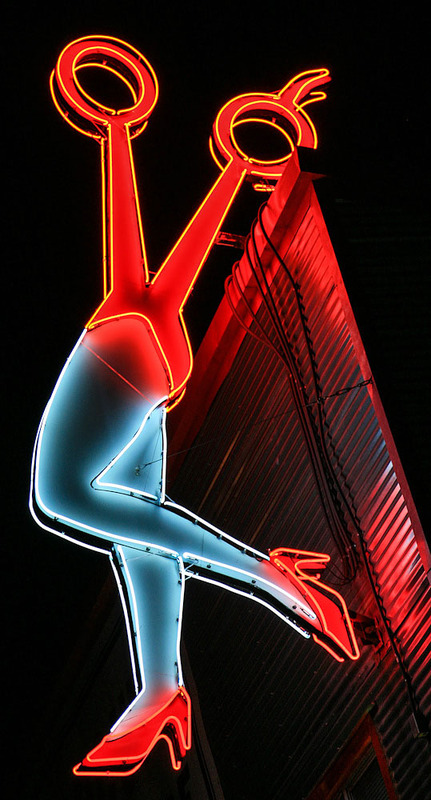 Check out the different shapes, colors, and swooping golden arrow that make up this marquee. Pat's Bicycle opened for business in 1947. The sign is no longer here after disappearing around 2010. An auto broker is currently on site. 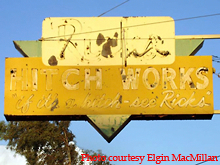 This old faded out sign is for Rich's Hitch Works in Phoenix, AZ. It's hard to depict what the sign looked like back in the day. 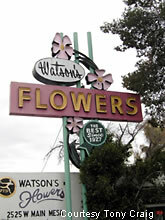 Quite a roadside sight, the Watson's Flowers sign towers along the busy boulevard in Mesa. Watson's was established in 1933 with the sits origins formerly a gas station. The sign itself is from the 1950's, built by the Paul Millet Sign Co., which also many of the other notable roadside signs in the area.